This striking print depicts three dead birds (a raven, owl and sparrowhawk) and a bat pinioned to a wooden door. 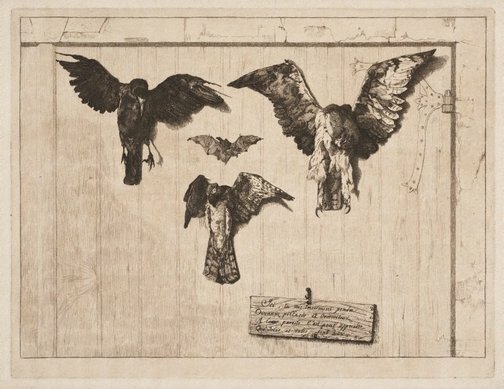 The artist’s son wrote that his father had come across a scene of birds nailed to a farm gate in the village of Villers-Cotterêts near Soissons, which inspired him to make the print. Bracquemond commenced work on the subject in 1852 and completed the plate some three months later in December. The year 1865 inscribed on the Gallery’s impression indicates the date of publication by Alfred Cadart. Bracquemond prepared his most famous print with beautifully detailed pen and ink drawings of individual birds, qualities that he skilfully translated into the medium of etching. Indeed, the naturalistic accuracy of Bracquemond’s observation is reminiscent of Wenceslaus Hollar’s masterful rendering of soft textures in exactly the same medium two centuries earlier. The meaning of this arresting work can be gleaned from Bracquemond’s verse, which he added to the plate in the fifth state: ‘Here you see sadly hanged / Birds that rob and steal from you / The lesson that can be learned / Is that flying and stealing are two.' With its pun on the French verb voler (to fly and to steal), the print can be read as a moral lesson implicating not only covetous and predatory birds but perhaps humans too. Bracquemond was one of the leading figures of the etching revival and a central force behind the formation in 1862 of the Société des Acquafortistes, the principal organisation for the promotion of etching in France. Essentially self-taught, he became one of the most recognised printmakers in the second half of the 19th century and was the recipient of numerous honours. He was also one of the earliest enthusiasts of Ukiyo-e woodblock prints who advocated the use of Japanese motifs and designs by artists and craftsmen. Bracquemond worked not only as an etcher but also as a designer of ceramics, furniture and jewellery. His most famous essay in Japonisme was a faience dinner service, known as the Service Rousseau, inspired by Hokusai’s book of Manga. Signed and dated l.r., [incised plate] "F Bracquemond / ... / 1865". Meryon, Bracquemond & the 19th Century Etching Renaissance , Sydney, 1998, illus. Prints & drawings Europe 1500-1900 , Sydney, 2014, col illus p 144.